[Stride]-Stride Step-[Choose one or more cards with the sum of their grades being 3 or greater from your hand, and discard them] Stride this card on your (VC) from face down. [ACT](VC)[1/Turn]:[Counter Blast (1) & Choose a face down card from your G zone, and turn it face up] Until end of turn, this unit gets "[CONT](VC):If you have a face up card in your damage zone, all of the rear-guards in your front row get [Power]+3000. If the number of cards in your damage zone is five, this unit gets [Power]+10000.". You know she only exists to make the GB2 of Gavrail easier to get too without Blizza. Because honestly Zachariel is sort of unimpressive. 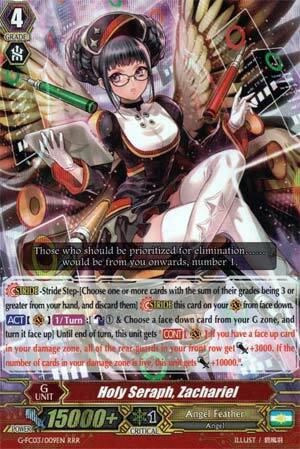 Once per turn, her ACT skill Counterblasts 1 and flips a G Zone card to give 3k to your front row as long as you have a face-up damage zone card. then she gains 10k if you have 5 or more damage. As I said, she's only here to use the GB2 of Gavrail. To be efficient you'd have to set up a column to be at 18k+ to force more guard, so if you're doing it to excess you need to pay attention to your Nurse of Broken Heart and Pegasus cards. The 10k is pretty unrealistic and by that point, you'd rather use Raziel to abuse the above cards. Get 1 for the GB2. Then never use for the rest of the fight. Instead of going into Blizza, you'd ideally go into her first in a Gavrial deck for the instant GB2. What you get is a 3k buff to the front row, so you can attempt to hit the opponent with unboosted 9k, now 12k, rearguards. Some beaters, like Black Dream, Zabaniya, will come out at 11k or higher, so you could then put a 7k booster down, use Zarariel's effect, and have that column force 15k shield or more. Celestials have 11k and 12k beaters by virtue of being a subclan, so she's pretty good in Celestial decks. That, and your board might already be full, so you don't need to stride into Celestials' dedicated stride, Mikael. b) you usually go into Raziel around this time to buff up your ponies and Broken Hearts. Basically, go into her if you want the GB2 on Gavrial, you don't want to stride into Uriel and attempt the on-hit effect, and/or you can make her 3k boost to the front row force more guard from your rearguard columns. Or, if you're at 5 damage and have nothing on board that will get buffed from Raziel's effect.